Chennai Spartans vs Ahmedabad Defenders, Pro Volleyball League 2019 Live Streaming and Telecast Details: When and Where to Watch PVL Match Online on SonyLIV and TV? In the penultimate league stage match of Pro Volleyball League, home side Chennai Spartans, will take on Ahmedabad Defenders at the Nehru Indoor Stadium on Sunday. This is the last league stage match for Chennai Spartans. Meanwhile, if you are searching for Chennai Spartans vs Ahmedabad Defenders, Pro Volleyball League 2019 live streaming, then you have landed on the right page. Below you will find all the details. Pro Volleyball League 2019 Schedule With Match Timings. Chennai Spartans are placed fourth on the Pro Volleyball 2019 points table and need a win to seal their place in the semifinals. Last night, Chennai Spartans lost to U Mumbai Volley 3-2. A win against Ahmedabad Defenders will help them stay in top four. Ahmedabad Defenders, on the other hand, are winless in the competition thus far. They have played three matches and have face defeat in all of them. However, all is not lost for them. In order to qualify for the semi-finals, Ahmedabad Defenders will have to beat Chennai Spartans and U Mumbai Volley. Which Channel Will Live Telecast Chennai Spartans vs Ahmedabad Defenders Pro Volleyball League 2019 in India? Sony Pictures Sports Networks have secured the broadcast rights of Pro Volleyball League 2019 and will telecast the matches in India. Sony SIX, Sony SIX HD, Sony TEN 3 and Sony Ten 3 HD will telecast the Pro Volleyball League matches live in India. Chennai Spartans vs Ahmedabad Defenders, Pro Volleyball League 2019 will begin at 7:00 PM IST. Where to Watch Free Live Online Streaming of Chennai Spartans vs Ahmedabad Defenders Pro Volleyball League 2019 in India? Calicut Heroes vs Chennai Spartans, Pro Volleyball League 2019 Live Streaming and Telecast Details: When and Where to Watch PVL Final Match Online on SonyLIV and TV? 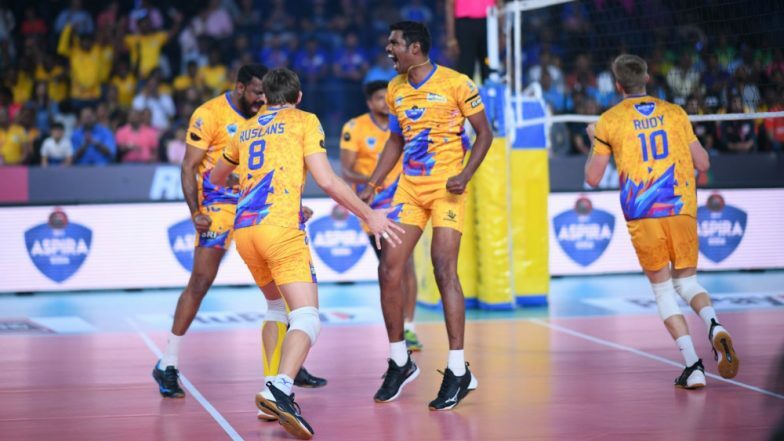 Kochi Blue Spikers vs Chennai Spartans, Pro Volleyball League 2019 Live Streaming and Telecast Details: When and Where to Watch PVL Semi Final Match Online on SonyLIV and TV?